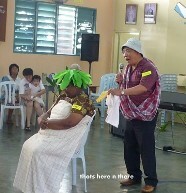 The narrator : Once upon a time, there lived an agriculturist by the name of Dr Chan who planted a real gigantic lobak. This big lobak won an award somewhere for something. Dr Chan was very pleased with his white lobak which was fertilized with cockerel..... 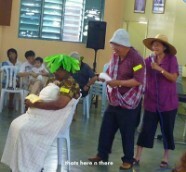 Anyway, he decided to harvest the lobak so that his wife can cook lobak in porkribs to share during CG. So he called his wife Rosie to help him to pull out the big lobak. 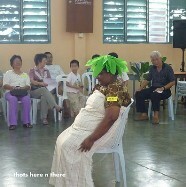 Unfortunately, the lobak was too deeply rooted, so they couldn't even move it an inch. 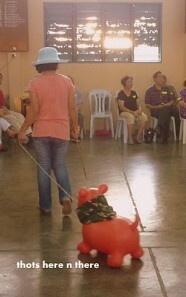 Then came along the CG member's maid taking the dog for a walk. So they asked her to help. 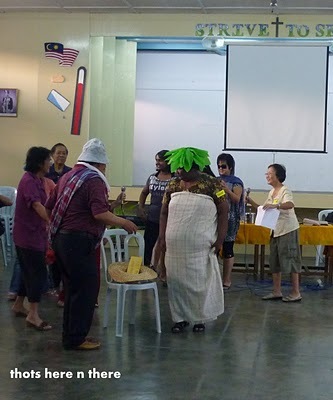 Before that, they also phoned Mrs Teng to join them in pulling out the gigantic lobak. There you see them huffing and puffing over it. 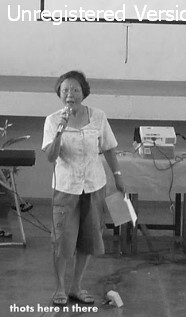 But they still could not pull it out; so Rosie phoned Mr and Mrs Poi to help them. Donna who just returned from Korea dropped by the house with some ginseng. It was hoped that the ginseng would give them strength to pull out the lobak. They got the lobak out of the chair and standing up!!!! Lesson learnt: work together as a CG and pray at all time, over all things! 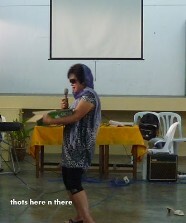 This was one of the skits put up by one of the CGs for the church Family Day. It was hilarious. The story was a very simple one but loaded with lots of lessons and fun. I was most touched by the enthusiasm shown by the all the CG members who are made up of senior citizens (except for the maid and Shanti's two daughters). 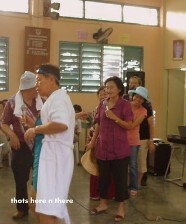 The earlier group that performed were also senior citizens (much older than this group)!